Mother's Day was(is) perfect this year. I woke up this morning to my wonderful family excited to wish me a Happy Mother's Day and give me the gifts they had made/chosen. They came with so much love, they are perfect. After all the hugs and kisses were over we headed downstairs for breakfast. Cereal was eaten and coffee was made. This year I had my in-laws over for Mother's Day Brunch. My Mother-in-Law, Father-in-Law, Sister-in-Law and two nieces. Wonderful company and wonderful food. The menu for the day was Lemon Strawberry Crepe Cake, cinnamon buns, Christmas Morning Wife Saver, farmer sausage, bacon and fresh fruit. My father-in-law was awesome enough to bring us some great farmer sausage and bacon that my husband cooked up. The kids love that, and to lighten the meal up my sister-in-laws family brought the fresh fruit. A wonderful addition, again a favourite for the kids. Here I am doing the final touches. I was very happy to be able to fulfill my Mother's Day wish by making yummy food and having special people in my life to share with. Of course not everyone was available and I did not think of them any less on this day while we celebrated the joy of Motherhood. 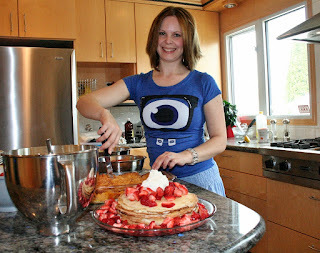 Whoops, it sounds like I am wrapping up my post, I got carried away with all my food love! After brunch the kids played in the backyard, doing what they love. I put my littlest one for a nap and my company left. Time to wind down. In our house I am pretty sure that the television doesn't know much exists outside of sports. The occasional kids show or home show gets turned on, but mostly the TV is off unless there is sports on. Recently however we discovered Wipe Out Canada, it is very fun to watch with the kids. We took a moment to relax while we watched and laughed. The final part of my family day was soccer. We had practice scheduled for this evening, we wanted to hold practice even though most of the kids on the team were unable to attend. When we got to the field it started to rain but we toughed it out. We did a few soccer drills, then ran up and down a big hill (in hopes of burning off some of the above mentioned brunch). It was a lot of fun. After about 1/2 hour we were soaked so we called it quits. At home my husband put everyone to bed, including himself and I settled in to sewing. I completed a wallet. I will post more about it later this week.